It was time for the Field of Lights tour. We boarded a bus, got off 10 minutes later, walked around, and were back at the bunkhouse 40 minutes later. “We could have almost walked to it, with flashlights!” Heidi said. But it was really cool, and beautiful. There was no “tour,” unless you counted the 30-second orientation to the night sky given by a young guy with an extremely heavy Chinese accent who stood on a milk crate and pointed out the Southern Cross. What this had to do with the lights wasn’t entirely clear. 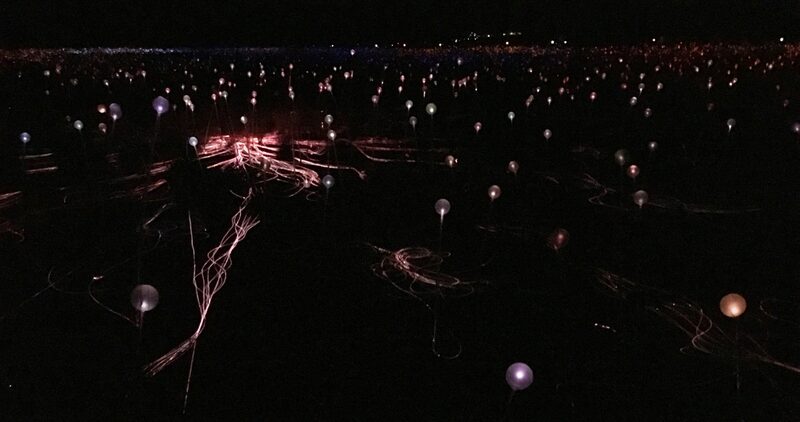 The lights were a work by British artist Bruce Munro—50,000 of them glowing organically in the desert. Heidi and I wandered in separate directions, lured by whatever instinct called. I wandered a bit too far and started walking back briskly when I realized our 20 minutes of off leash time was almost up. It was so dark that I headed in the wrong direction. I imagined being stranded out here all night. Would they turn the lights out? Would I, as a Minnesotan, be able to survive the desert cold dressed only in light clothing and flip flops? Would I have to stay awake all night to fend off the dingos? What if I stepped on a scorpion in the dark? Could I collect enough dew from the spinifex grass to wash it out? My daydreaming was interrupted by the sight of someone kneeling on the ground and vomiting violently. I could make out that it was a man and his friend was standing over him patting his back at arm’s length. “Must ‘ave been something ‘e ate, I reckon,” said the friend. At the bus I let the Chinese star guide know there was a man down, and he hurried off. He’d probably be in trouble if they got off schedule and the next batch of $42 tourists was delayed. “Did you see that guy throwing up?” I asked Heidi as I sank into my seat. “Yeah, how awful. I wonder if it was from the $210 Sparkling Wine Sunset Dinner?” she asked, deadpan. I woke up early and walked up to the lookout to see Ularu at dawn. On my way back the quiet was broken by raucous cries coming from the branches above my head and I looked up to see a dozen large rose- and grey-colored birds squawking. 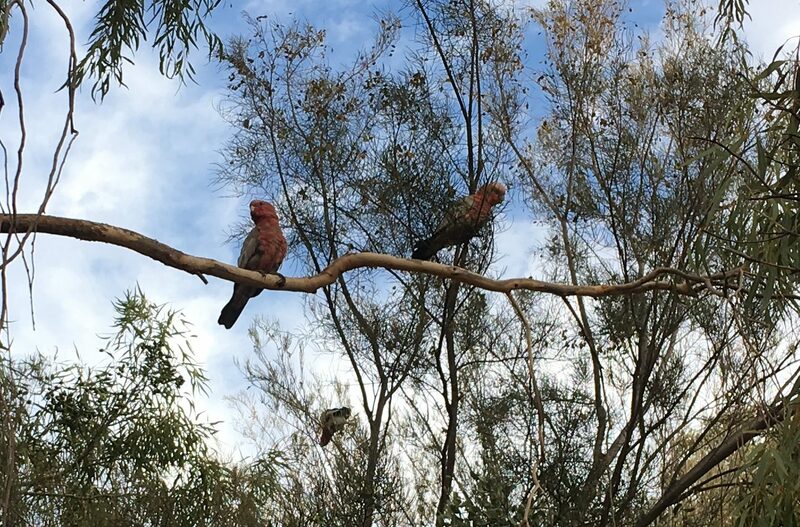 She looked blearily at my cell phone as I shoved it in her face and laughed, “Aw, Annie, those are Galahs. 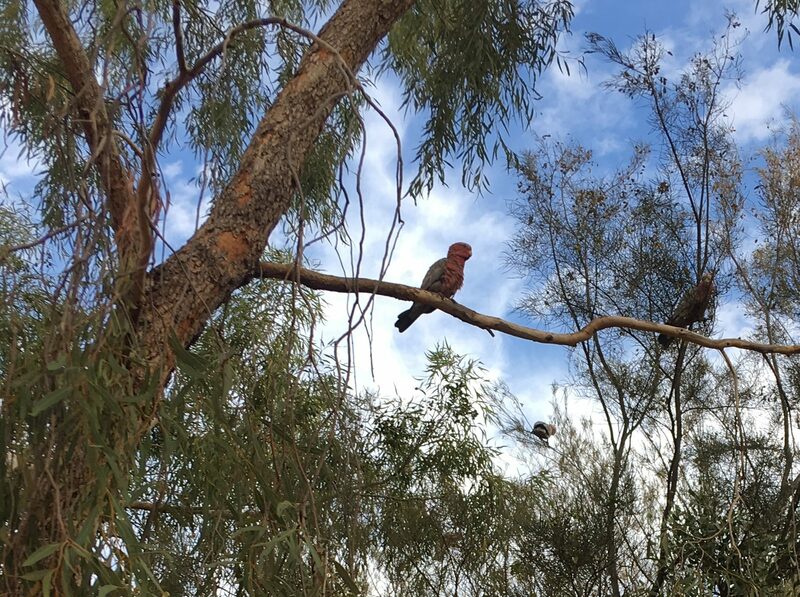 They’re like your squirrels.” Galahs, also known as the rose-breasted cockatoos. “Not so well, thanks to this heat pipe two inches from my face,” Heidi said as she whacked it with her fist. We knew today would be another long day, so we had paid $25 apiece for the breakfast buffet. There was a $5 discount if you paid the night before. I thought maybe this was so they would have a head count, but when we rocked up to the buffet I began to suspect that they didn’t want people to know how it was until it was too late. Everything was cold. Not cold as in refrigerated; as in “formerly hot but now not.” Cold, limp bacon. Cold spaghetti (spaghetti is a real fav in Australia). Cold baked beans. The scrambled eggs were sitting in a half inch of pale yellow water. We stuffed ourselves with things that weren’t supposed to be hot, like yogurt and fruit and rolls. The hostess, a middle-aged white woman, was friendly and attentive as she poured the lukewarm coffee. “What’s the deal with tipping here?” I had asked the first day. Heidi was adamant that no one tipped unless you were at a fancy restaurant with a large party and the service was exceptional. Then you might round up the bill. This entry was posted in Adventure, Budget travel, Culture shock, Living abroad, Travel and tagged Australia, Field of Lights, Outback, Tipping, Ularu on November 16, 2018 by Breaking Free.